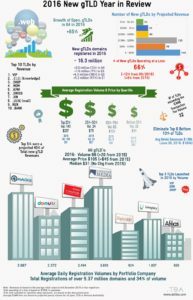 Registration Volume of new Generic Top Level Domains Sept 5, 2014, there are 378 delegated new gTLDs. .XYZ still has the highest average daily registration volume with 4,593 registrations per day (a further decrease of 377 compared to two weeks ago, the prior period had an average daily decline of 983). .XYZ average registration volume includes free registrations. .公司 (.xn--55qx5d meaning ‘business organization’) begins general availability with an average of 1,236 registrations per day. .HAMBURG daily average increases from 780 to 1,011. 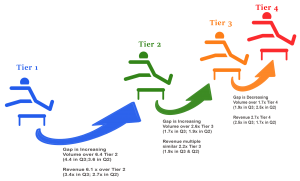 网络 (.xn--io0a7i meaning ‘network’) also begins general availability with an average of 860 registrations per day. .BERLIN continues to decline from 887 to 830 which also has offered/offers free registrations. A third new gTLD enters the top ten which is .LONDON with an average registration of 711 names per day. Similar to the prior periods, .CLUB has 657 registrations per day (down from 685 in the prior period) followed by .WANG with 628 daily registrations (which has increased from 620). .GURU remains steady with an average of 322 daily registrations (an average daily decrease of 12). The final spot of the Top 10 goes to .TOKYO with an average of 256 registrations per day, a decline of 21 per day from the previous 277). 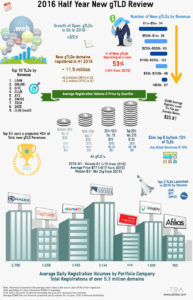 Overall, the average daily registrations of new Top Level Domains for the top half of all registries is approximately 187 (an increase from 178). However, if you eliminated .XYZ (the abnormality) from the top half, the average per registry falls to 143 which is also up from 129 from two weeks ago. 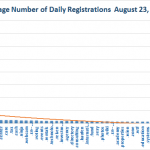 The bottom half daily average number of registrations is 21 (no change when compared to the prior period). The third and fourth quartiles have no change from the prior period with an average of 28 daily registrations and 15 respectively. 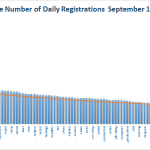 The bottom half daily average number of registrations is 21 (no change when compared to the prior period).